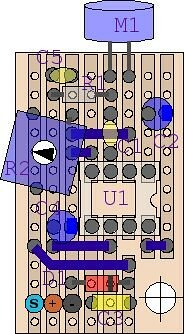 How to create boards with vias and straps with Eagle ? Since I want to have the minimum straps, IÂ declare the top layer as forbidden. This forces Eagle to create as tracks as possible on the bottom layer. 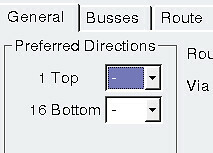 Then (and if not 100% routing done), IÂ activate the top layer, but declare it as costly. 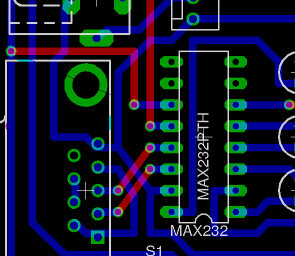 Eagle will finish its work,Â still creating bottom tracks, andÂ adding small top tracks through vias, which I can then convert (consider as) to straps. Just a reminder here. 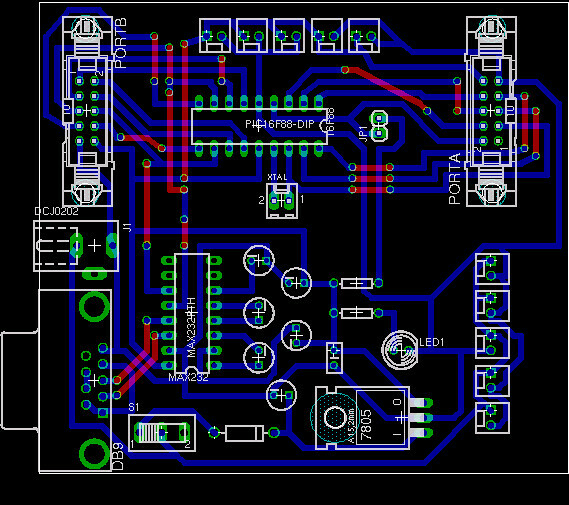 Since I use a PCB pen, which can’t produce accurate results (because of the pen and I), I configure Eagle to create quite large tracks. 32mil works for me. This constraint will help while actually drawing tracks. Same things while drilling holes.Â Drilling is quite critical, it can easily destroy your board. So, first,Â top layer is deactivated. 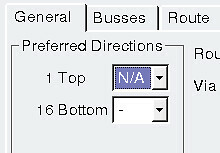 This is defined in theÂ Design rulesÂ menu entry. 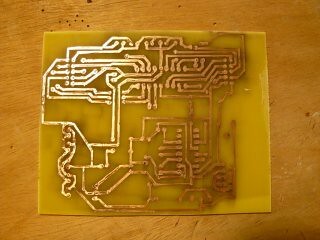 NowÂ 100% routing is done. SeveralÂ short top tracks were createdÂ (red). Most can be considered as straps. Â And some definitively can’t… This is where I still need manual work. For instance,Â few top tracks are going under componentsÂ here. Since wires (straps) are quite thick, there’re problems here. This occurs when Eagle directly connect tracks with pads. I didn’t find yet where to forbid this. 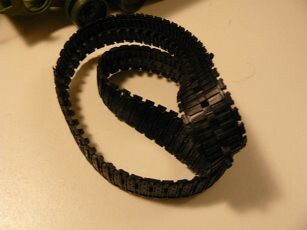 I need toÂ move the bottom tracks outside of components,Â and recreate the straps. There’s still manual intervention, but let Eagle optimizing routing produces better results than humans can do (as least me…). I’ve been struggle (I mean fighting against the whole universe’s darkness) for three month trying to drive DC motors with a PIC 16F88. I know it would be tough, but I didn’t know it would be so hard… Because this is about driving high currents (from ~500mA to 1A), and not just logic states as before. ThisÂ SirBotÂ ticket is a nice summaryÂ of what I’ve faced. 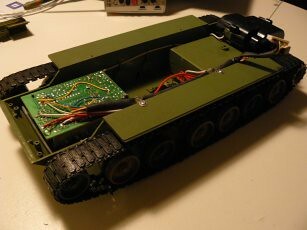 AfterÂ dissecting a RC car, this is time for dissecting a RC tank… It’s been a while since I wanted to build a robot, a mobile robot, with tracks. Because tracks are cool, give nice mobility. But tracks are expensive. 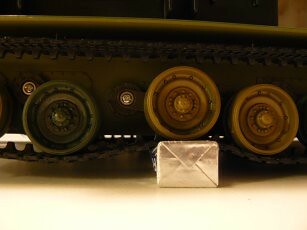 Very expensive.Â Tracks from lynxmotionÂ cost about 220$, this price seems to be an average… So, using a rc tank could give a nice frame with tracks, ready to be used. 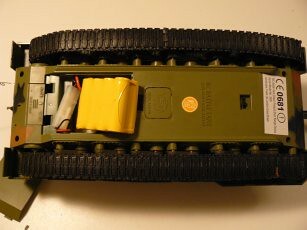 Of course, quality cannot be the same (at least for the tank I have), but that could be an interesting proof of concept.RC tanks can be found easily onÂ eBay. Prices vary a lot, but if you wait enough, you can get a nice one for very few. I got mine for 30â‚¬, shipping included (my first purchase on eBay). 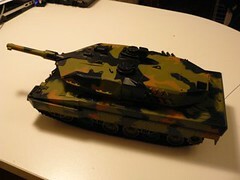 This a Leopard II A5 (but whatever…). First of all, let’s have a look at those tracks. 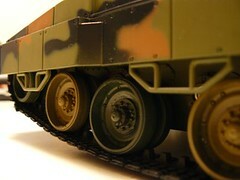 As in many tracked-vehicule, tracks are shorter on the bottom than on the top. This ensure minimal frictions while rotating (but less stability). Every wheels over the tracks have suspensions. 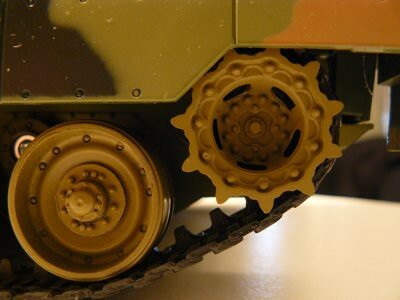 While this seems cool, the poor quality may add a lots of “noise” while controlling the future rc tank based robot… Only the very last rear wheels drive the tracks. This is where motor are connected. All other wheels are just guide. Batteries can be found on the reverse side. These are NiCd 1000mA / 9.6V. 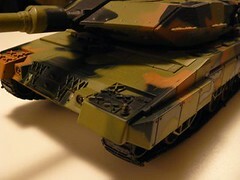 On the same side, five screws protect the tank from seeing its guts… Only one connector, which can be plugged/unplugged as needed, separate the base with tracks from the turret. 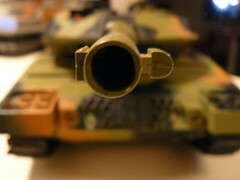 Thats really good news, as hacking this tank won’t be too invasive. 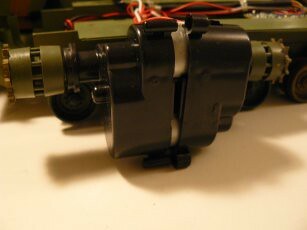 Here’s the motors’ block… Opening the block shows two DC motors… As expected, both can be controlled separately. 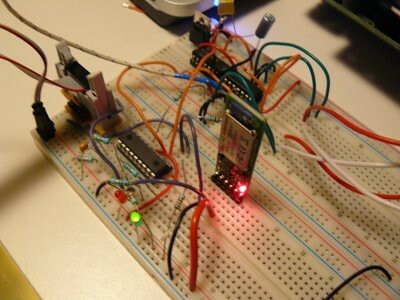 It’s been weeks since I’ve tried to build a DC motor controller board. 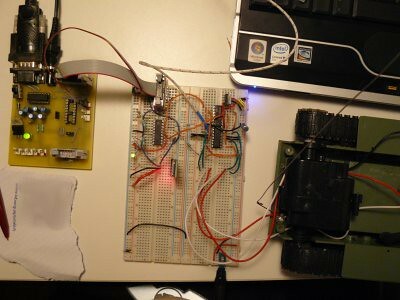 Particularly, this board must include a way to control and monitor the motor speed. This is an important step since it’ll be used as a dead-reckoning system on my future robot. Another way to do this is measuring the back-emf feedback. This is well describedÂ here. 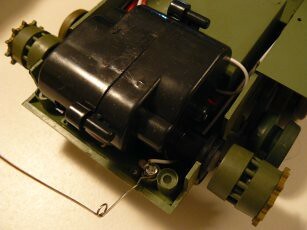 Basically, voltage coming from the motor, while it’s turned off (not powered), must be measured using ADC. The value is proportional to the speed of the motor. 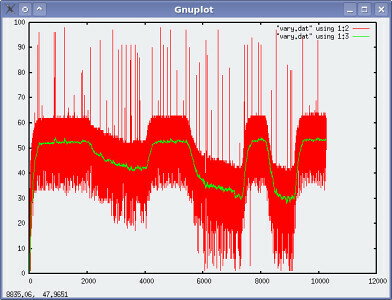 Compared to the voltage applied, it’s possible to know if the motor is turning as expected or not (too fast, or more plausible, too slow). And possibly to adjust the applied voltage to correct the speed. 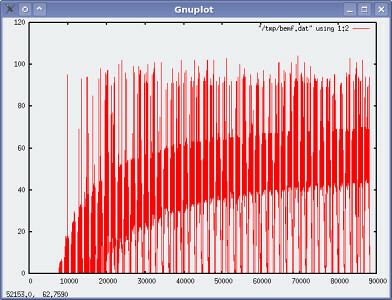 Lot’s of noise (more on this later), but we can clearly see how the motor is accelerating, step by step. 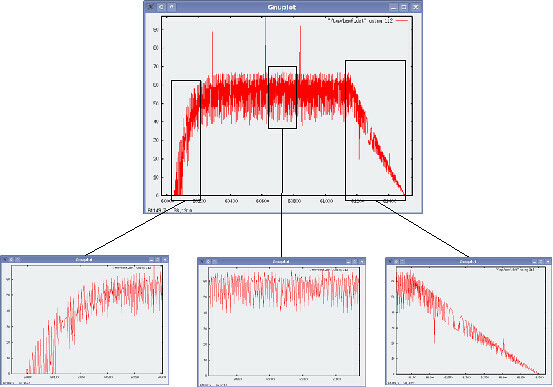 As expected, while the PWM increase step is constant, acceleration is not linear. a constant phase. The end of the phase is when PWM is turned off. During this last experiment, I voluntarily slow down the motor several times. The green line is the sliding average, usingÂ kÂ = 0.98 (the new measure has only 2% weight in the average). More readable, heh ? 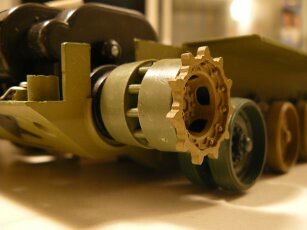 As a robot builder,Â what can you expect to get from a rc carÂ ? In great “Robot Builder’s Bonanza“Â book, authors say: “You should considerÂ hacking an existing toyÂ to build you own robot platform. You’ll save a lot a time”. Building a robot mainframe from scratch is clearly time-consuming, particularly if you don’t have correct tools et materials. This being said, what can you really expect to get from a hacked toy ? 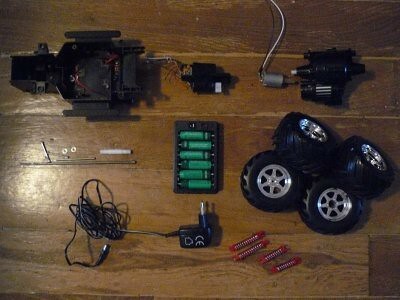 That’s all… I plan to assemble some of this pieces to build a mobile robot. 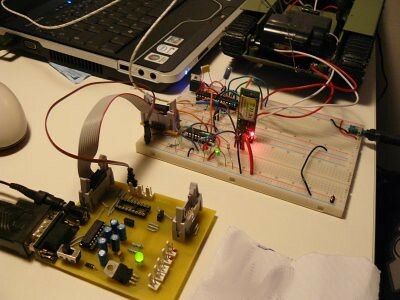 Last entry was aboutÂ designing the mainboard, using Eagle. 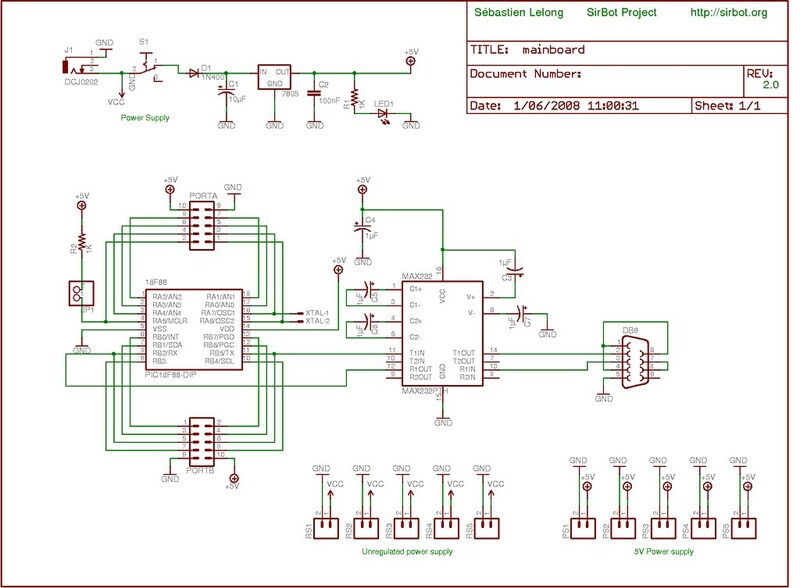 The result is a layout diagram, which will be the starting point of the next step:Â building the PCB. 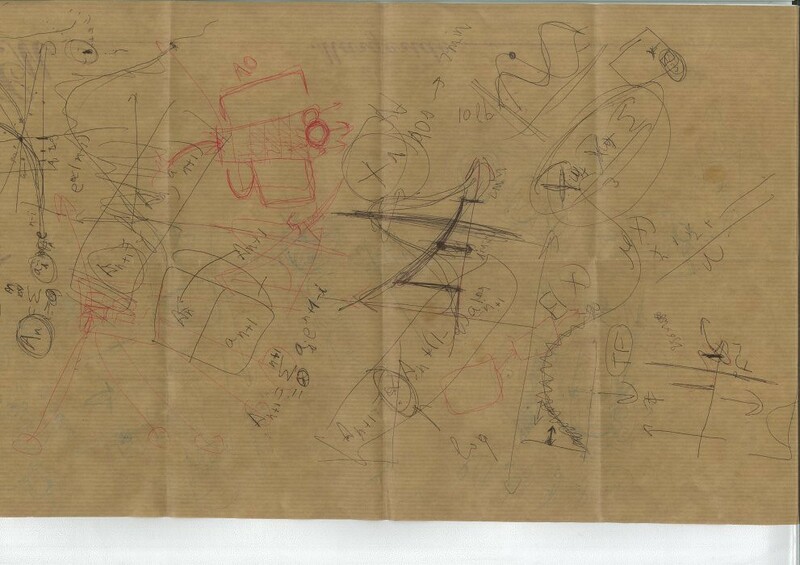 TheÂ layout diagramÂ is saved as a postscript file (print into file) to get 1:1 scaledÂ picture. 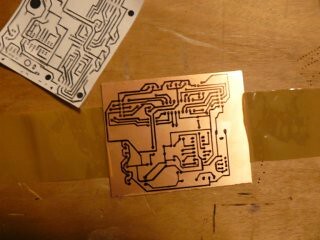 It’s then lay down on a copper board, using adhesive. Using somethingÂ sharp, like a screw, each hole is marked. 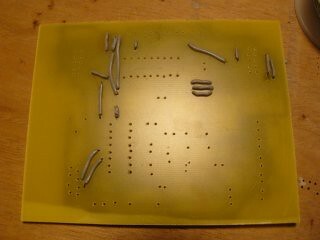 This is used to localize the holes once the paper is removed (…), and will later help to guide the drill bit. Once done, the paper is removed. 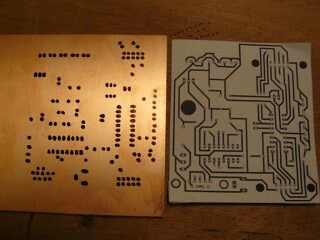 Using a special PCB pen,Â each hole is marked, according to the layout. About the pen, it appears other pens also work, though I’ve tested these with details. Particularly, pens used to write on CD-ROM work nice. 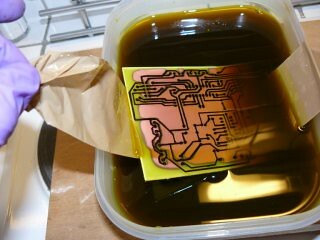 The thing is to spread a thin layer which will protect the copper from the ferric perchloride. Start drawing the tracks. This step is very important and delicate. 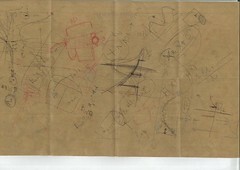 Tracks mustn’t be in contact, the drawing must be regular. 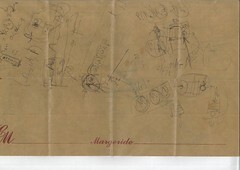 The reproduction of the layout is done. Double-check the tracks. Now it’s time toÂ cut the board. Use adhesive on both sides of the board. It’ll make the manipulation in the ferric perchloride bath easier. 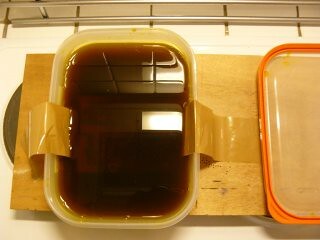 Put the board into the ferric perchloride bath, and fix it on the sides using adhesive. Be careful, the ferric perchloride is very toxic and dangerous (acid). Use gloves, protect your eyes and your clothes. Depending on how “new” is your bath and the temperature, the required time to “burn” the board may vary. About 30min later, the copper starts to disappear. 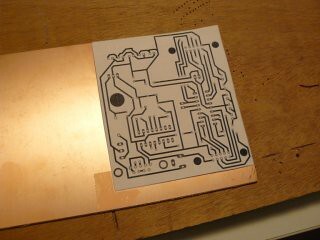 One this step reached,Â smoothly shake the board into the bath, until all the copper is gone (and the tracks still there…). About 5 to 10 min later,Â the board is ready. Get off the bath and rinse with water. The tracks are black due to the pen. It’s time to clean it. … like these ! One track has disappeared, another has several cuts on it. 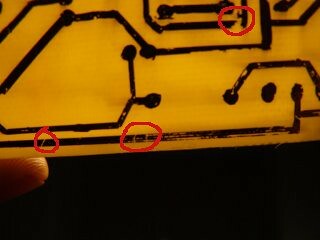 Fortunately, these can be fixed using some wires and an soldering iron. Start drill the holes. This step is very delicate and could permanently damage your board: while drilling, the drill bit can slide and cut tracks. The best is to use a drill press. Depending on how you’ve marked the holes, things can be easy. I prefer to drill first with a 0.6mm drill bit, then use a 0.8mm one. 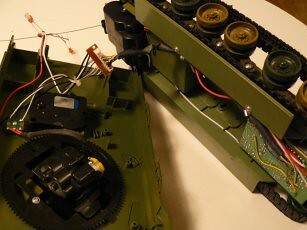 Some components required a bigger drill, like the power supply jack, trigger and 7805. ThenÂ solder the components. Start with the straps, as they may be hardly reachable once every components are on the board. 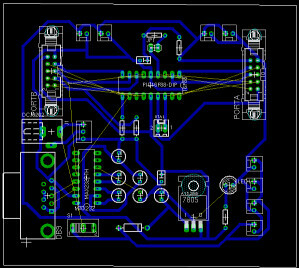 Point-to-point wiring, using pre-drilled boards is tooÂ time-consuming,Â hard to reproduceÂ andÂ ugly… More, producing a picture likeÂ this one, representing the actual board, costs a lot (since noÂ software can provide this, AFAIK). It’s time to switch to a better environment. 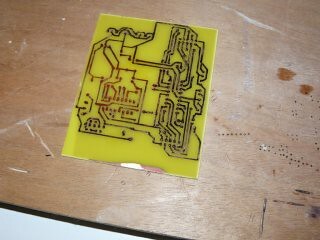 So the idea is to produceÂ PCB boards. 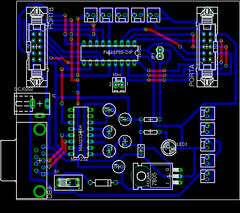 But, before, I need to design the board.Â EagleÂ is a great software,Â available under Linux. 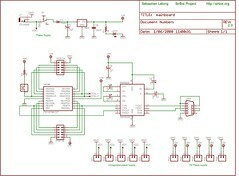 It’s free forÂ non-profitÂ applications.Â It can be used toÂ draw schematics, using a hugeÂ library of components. When done,Â EagleÂ is able to produce theÂ PCB layoutÂ (usingÂ autorouting). 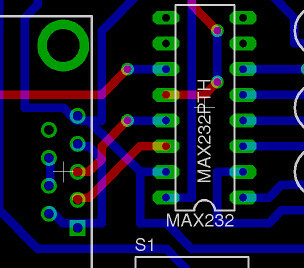 Drawback is it’s quite tough to learn.SparkfunÂ has greatÂ tutorialsÂ which helps me a lot:Â drawing the schematics,Â building the PCB layout, and evencreating new parts. 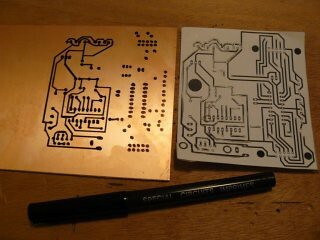 First step is to draw the schematic. 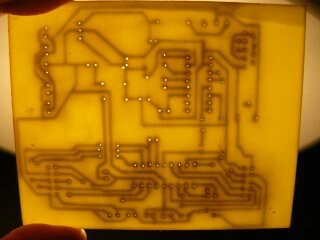 I’ve started from theÂ previous mainboardÂ and added modified it, according tothis ticket. Power supply is now provided by several connectors. They provides either +5V, either the unregulated power supply (used as input to 7805). The big 2×13 HE-10 connector is not splitted into two smaller 2×5 HE-10, one for PORTA, one for PORTB. 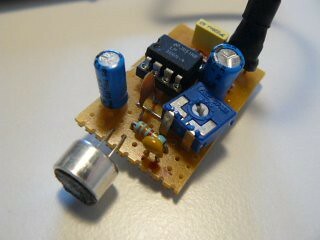 +5V and ground are also available for convenience. Xtal quartz is now connected as a small board, so 16F88 can be configured to run with its internal oscillator (more, using different Xtal frequencies involves different caps, so Xtal and caps are dependent). Finally, a push button on MCLR can be used to reset the PIC without switching the power supply off (a little straight, but it works…). Once done, I print the layout in aÂ postscript fileÂ (so scale is 1:1, whatever the resolution is), checking “Mirror” and “Upside down” options. 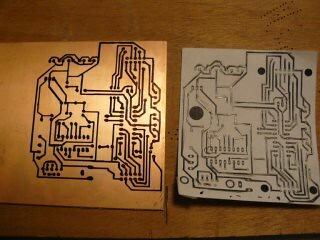 The layout is ready to be reproduced on the copper side. Here’s aÂ linkÂ to the postscript file. pin RA6 is not connected the PORTA HE-10 connector: (bottom right pin in the connector is a orphan)… Can’t really know why, since it’s connected in the schematic. Probably weird problems while connecting nets together. It’s not that important, since this pin is reserved for Xtal (when used), thus can’t be used in any daugther board. the power supply polarity is inverted: ground is in center, + is around, while it’s often the invert. I’ve been fooled by the schematic of the power supply jack. 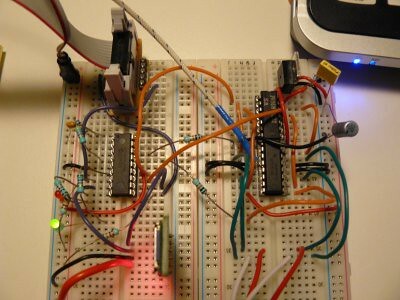 Note a diode will prevent any polarity problems if not connected correctly. If the LED won’t light, the problem may come from this. One the main problem withÂ my botsÂ (or the like…) is the way communications occur. I mean it can only useÂ RS232 with a cable, and bots must stay closed to the PC from which they are actually controlled and monitored, and where data is stored. Basically, I need them to beÂ wireless. A first approach would use aÂ PDA. 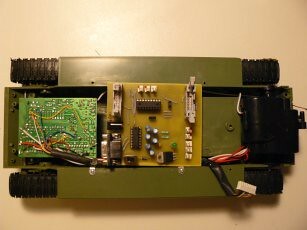 The bot is connected to, with a RS232 cable (iPaq PDAÂ have a serial connector). PDA then talks to the server using its builtin wifi or bluetooth and sends collected data. There’re even Linux distros which can be used on an iPaq, such as theÂ familiarÂ (works nice!). The problem is each time I need a bot to be wireless, I need an iPaq. And an iPaq isÂ expensiveÂ (~ 120â‚¬ @ ebay). And big. And the one I have can’t have wifi or bluetooth. WifiÂ ? Why can’t I use aÂ Wifi boardÂ ? It’s way tooÂ expensiveÂ (~ 200â‚¬)… UART to wifi boards cost a lot, because from UART to Wifi, there’s a lot. AnotherÂ problem is the battery life. If I want my bots to be wireless, they also need batteries. And wifi eats a lot of energy. Recently, I’ve found some niceÂ bluetooth OEM boardsÂ @Â Lextronic. Cheap (~ 30â‚¬) and easy to use (on paper).Â Battery life is okÂ using bluetooth. Yeah, bluetooth seems to be the solution. When I’ve come to see those boards, I’ve realized how small they are. WayÂ too small… That would be an advantage. But not for me, as I can’t even solder it (no pins, connectors are under the board). 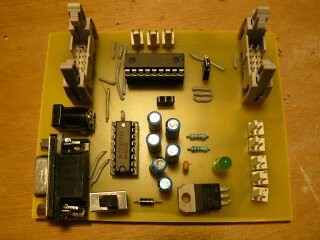 There’s another version: the OEM board is soldered on another board, with ready-to-use connectors. Even those connectors are too small, and this time this is twice the price (~ 65â‚¬). ZigBee is my better choice. For now… The only problem is I need one on my PC. Next step is to check how this could be (very) easily done).